Hi there, this week over the Neat and Tangled Blog we are having a special collaboration with Tonic Studios! I was thrilled when I heard about this activity as for me this was the perfect marriage ..I also have the honour to be part of the British Tonic Studios Desing Team! Yay! So for today, I made 5 super duper easy and quick projects using the new Panda Neat and Nice Die, So Many Sentiments stamp set and Geometric Circles Cover plate by Neat and Tangled, together with a cupcake, an envelope, and a banner die sets by Tonic Studios. The main project in the video is a cute Panda Cupcake Box and I walk you through the process of making the box while showing you supplies by Tonic I use in a daily basis and I also love. 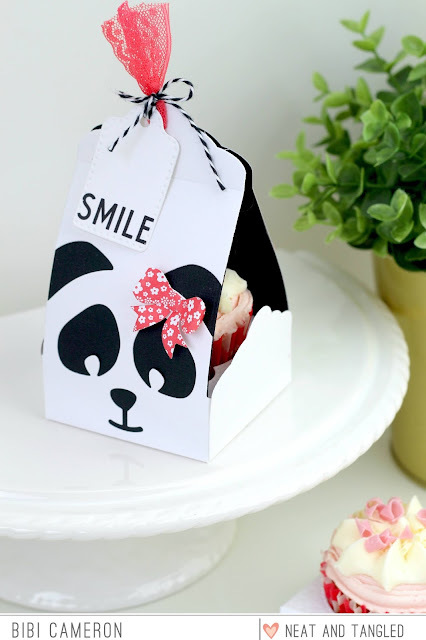 You can also use this cute Panda box as a goodie bag .. it is stinking cute. Isn't it? 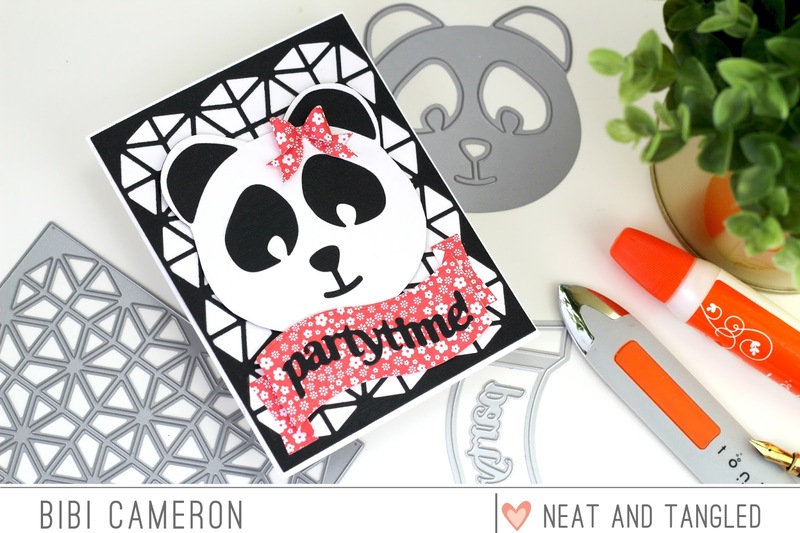 You can customize this box using the Panda Die to create different animals by changing the cardstock colour and adding different embellishments. I keep it simple for you today so I stick to black & white projects with a hint of pink. 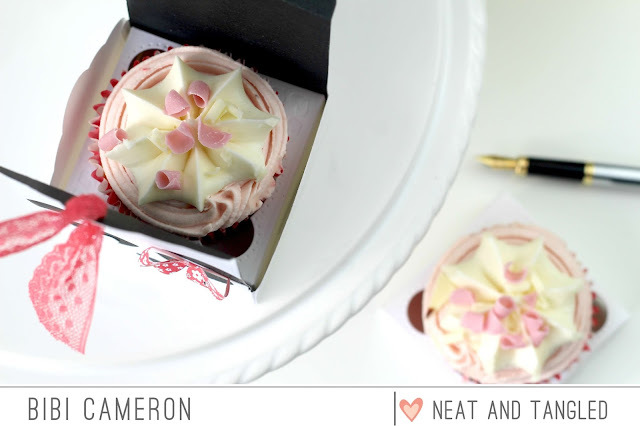 The cupcake and treat box die set by Tonic also have a die to create an insert to perfectly fit a cupcake inside. 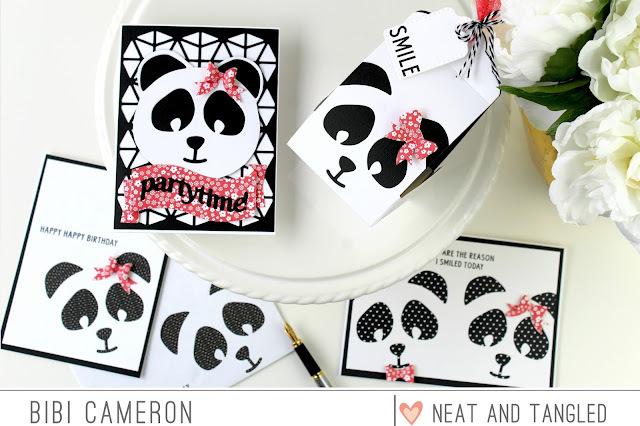 I also used Sweet Nothing - Delicate Embrace a C6 envelope die to create a fun panda envelope and a matching card. 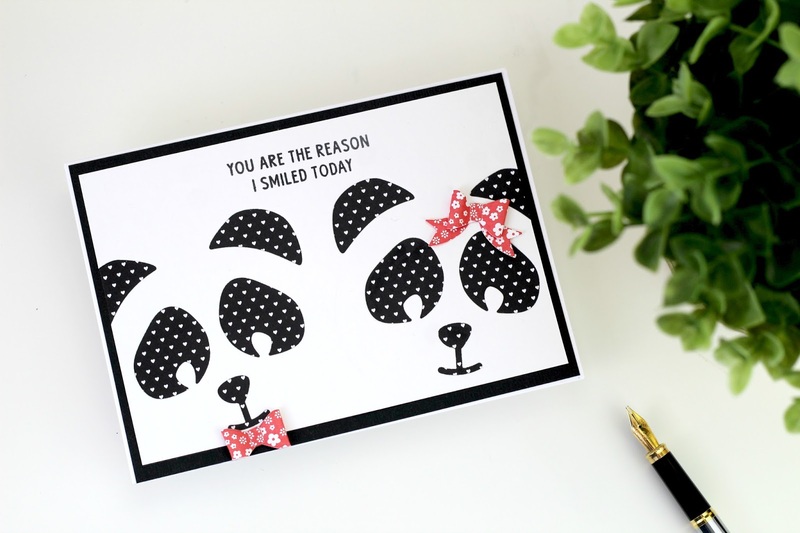 For the card below I just used the Panda die by Neat and tangled to die cut a panel twice and create a panda couple. Hmmm ... this could be a belated Valentine card for my hubby. I made the 5th sample to show you how easy is to cut the panda face and use it as a topper. I also added a background panel using the Neat and Tangled Geometric Circles Cover Plate Die to make a quick children party invitation. I'm loving the Panda die by Neat and Tangled, it is so easy to use! Bibi I loved all the inspiration in this video on those 5 projects, fabulous, fell in love with that panda the first time I saw her/ him on the sneak peak from N& N.
These projects are so adorable. Thanks for sharing the technique video. Very cute little Panda cupcake box. I just discovered your "You Tube" channel and have been catching up with your postings. Love your ideas!! And your English is fine. Note: As far as your mat moving on your glass top table. Buy from Home Depot or Lowes some of the round or square rubber picture bumpers you stick on the back of a framed picture so it doesn't move on the wall, and adhere several of those to the back of your rubber mat. Just make sure you have enough on the back so your mat is balanced and flat Your mat will not move on your glass table anymore. Or you can glue rubber shelf liner that comes in rolls from Bed,Bath & Beyond to the back of your mat, that will also prevent it from moving.